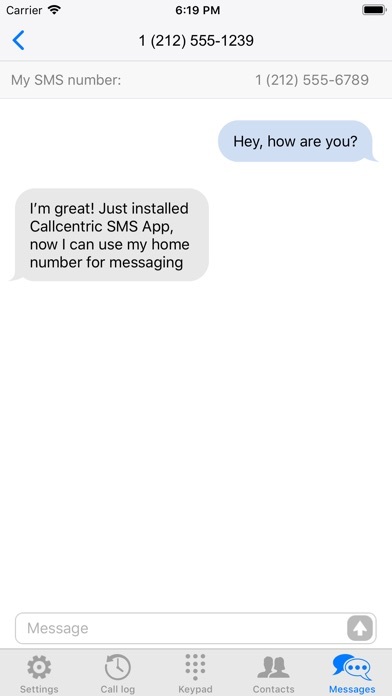 Our Callcentric App has been revamped from the ground up with a modern interface, SMS Support, and expanded functionality for our popular Click2Dial Feature. *To use this app you must have Callcentric VoIP Service **SMS Feature requires that you have an active SMS Access Plan on your Callcentric Account **MMS (group messaging, messages with attachments, etc) IS NOT currently supported ****Click2Dial IS NOT a true softphone client; it is a call bridging feature that gives you the ability to use your Callcentric Service to place calls from any phone NOW SUPPORTING SMS! = = = = = = = = = = = = = We now support SMS on ALL of our US/Canada Numbers! Getting started is easy, all you need to do is activate one of our SMS Access Plans on your Callcentric Account and install our new app on your iOS Device. That's it! 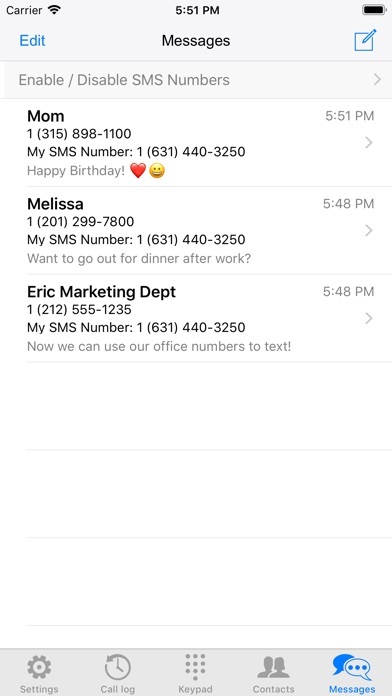 With our new app, you can: •Send/Receive SMS Messages in real-time • Enable/Disable SMS Functionality on any of your US/Canada Numbers SAVE MONEY AND EXTEND YOUR REACH WITH OUR POPULAR CLICK2DIAL FEATURE! = = = = = = = = = = = = = = = = = = = = = = = = = = = = = = = = = = = = = = = = = = = = With our Click2Dial Call Bridging Feature you can use your iOS Device to place calls using your Callcentric Account to destinations anywhere in the world. With Click2Dial you can: • Save money on international calls when traveling or at home by placing them from your Callcentric Account rather than at expensive cellular rates • Place calls using the CallerID of your Callcentric Numbers from any phone • Make calls from areas where no cellular signal is available but you have access to WiFi Using Click2Dial is as easy as 1, 2, 3! 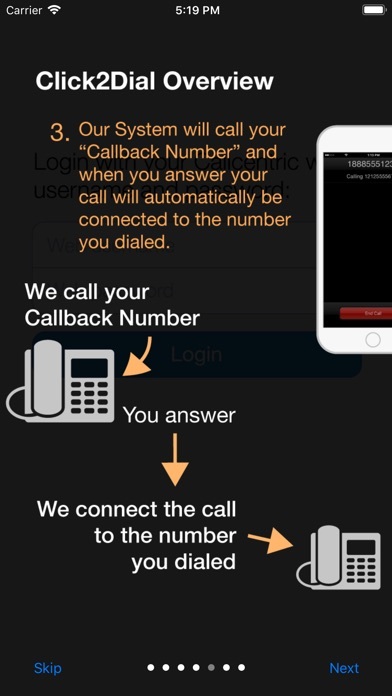 • STEP 1 - Enter the "Callback Number" that you would like to use to "bridge" your calls from. This can be your iPhone Number, hotel room, office phone, etc. 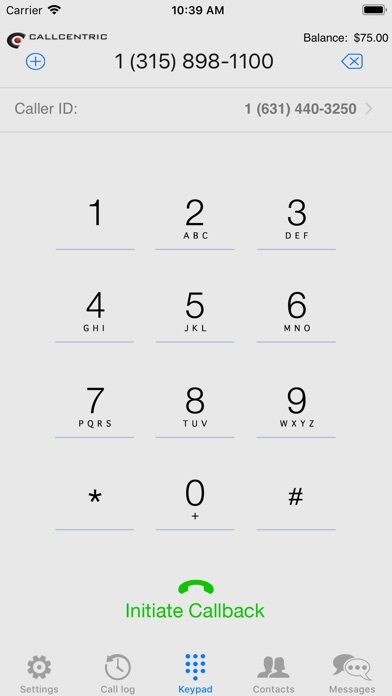 • STEP 2 - Dial the "Destination number" you want to call and tap the "Initiate Callback" button on the keypad • STEP 3 - Our system calls you on your "Callback Number", you answer and then are automatically connected to the "Destination Number" you dialed. THAT'S IT! OTHER APP HIGHLIGHTS: = = = = = = = = = = = = = • Our simple, clean interface and built-in tutorial will shorten the learning curve and get you up and running in minutes • Call other Callcentric Customers on their 1777#, even if they don't have a "real" phone number • Send/Receive SMS Messages on multiple numbers all from a single device • Place calls or send messages directly from your "Contacts" or "Call Logs" • Check your account balance in real-time Access to Contacts (Optional): • Used to properly show the Name Information if the Phone Number matches with an entry in your iPhone/iPad Contacts. Your Contact list will NEVER to be uploaded to Callcentric. 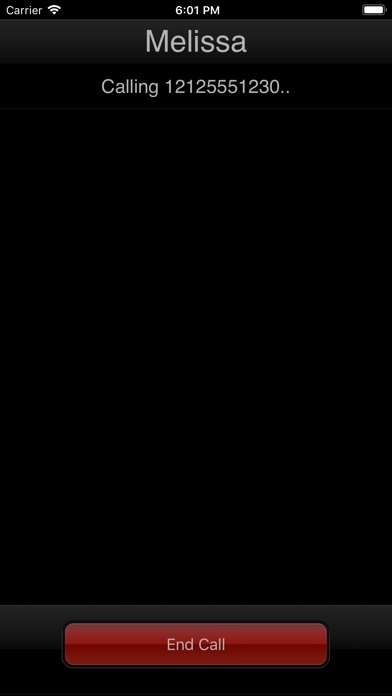 Data is used locally within the app. We do not have access to your Contacts outside of the app. You are better off using a true VoIP app such as Zoiper. I’ve never understood the advantage of a click2dial app for the user. It incurs double the Callcentric charges plus your cell phone minutes if you choose to receive the callback there. UPDATE for newest version: I'm grateful this app is getting attention and nice features. But on my iPad Air, iOS 9 (yeah, old OS) it seems to immediately crash. UPDATE again: after deleting app and reinstalling, it now launches fine. Looks great, totally new!! I don't need to use this app much but it is really great to have when I do need it, like making long distance calls while I'm at work (without making employer foot the bill for my call). But mostly I use Acrobits SoftPhone app with Callcentric. I've been a customer for years and finally disconnected my landline and ported my number to Callcentric (I used their free NY number before that). Very high quality service. Can't call out and can't receive inbound calls from app. The desktop app has some interesting voicemail options though. This is not a true sip/VoIP client. 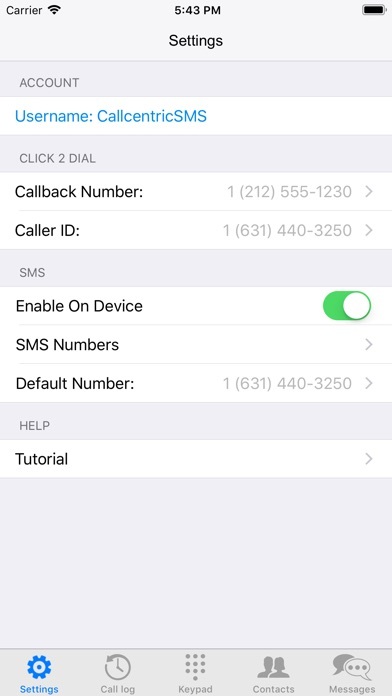 This is a click2dial app where it calls you first and then makes the connection afterwards. If you are a callcentric pay as you go client you will get billed double per call. Charge for incoming and the minutes for the connecting outbound call.... This can eat your balance real quick! I spend a lot of time abroad, so I've tried nearly every VOIP app out there, including Hangouts by Google, Burner, Pinger, Magicjack, etc. I've followed the online instructions for this app several times now over the last 2 years, and I've yet to be able to receive or complete a call using the Callcentric iPhone app. Save your balance and use a free service. Downloaded app, it crashes at startup. Worthless. Call centric services are great and highly recommended, but not this app. Waste of time. This app is pathetic. I'm very happy so far with callcentric, but this app has not contributed whatsoever to my satisfaction. I'm using 3cx with good success, but this app is horribly disappointing. Don't let it discourage you from signing up for callcentric, because the service works quite nicely. Don't rate it if you don't understand it! This is a supplementary app to Callcentric VoIP service. It does the same as their "Click to call" feature on their web site does. This is not the primary way that their service functions. Callcentric is a BYOD (Bring Your Own Device) SIP VoIP provider. You can use their service with a number of SIP devices: routers, ATAs, SIP phones (hardware and software) and even SIP apps for IOS (such as Groundwire or SIP Pphone). You can also use their service with VoIP PBXs, such as Asterisk, Cisco Unified Communications Manager Express, etc. Their service is extremely reliable and is of great quality. Additionally, it's extremely reasonably priced. Their tech support (via email) has almost instantaneous response and is probably the best among their competitors. 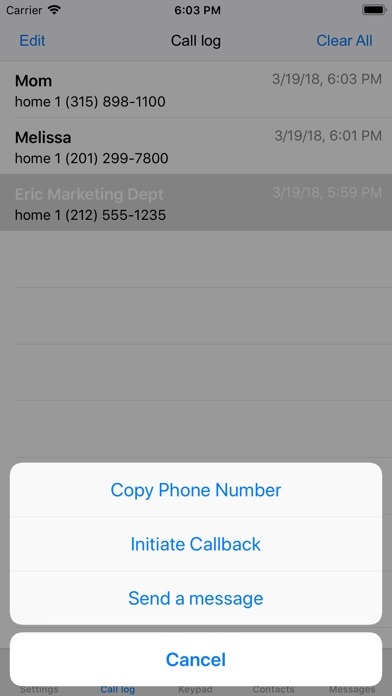 The "Click to call" feature that this app provides is only useful if you need to make a call from either a restricted phone, which cannot make outbound calls, or to bypass expensive fees that a phone service may have. For instance, if you want to make a personal international call from your work phone, you can use the "click to call" feature to have Callcentric call you and then have Callcentric call the international number. Their International rates are the best among VoIP providers, by the way. This app would allow you to bypass the exorbitant international fees that your mobile provider charges per minute. Most of Callcentric international calls are $.03 - $.07 per minute. Also, if you purchase the SIP Phone or Groundwire app, and set the app up to work with Callcentric, for which they have a pre-set, you can call anywhere using VoIP, so you would not be spending your mobile minutes. I've had Callcentric for over four years now. I'm a VoIP engineer, and am using their SIP service for my home PBX, as well as for my VoIP lab. I've also used their service on my iPad and iPhones when traveling internationally, which allowed me to call from a foreign county as though I was calling from the US. I was also able to receive incoming calls at my US number while being overseas, utilizing my iPad and/or iPhone and the Groundwire app. The SIP Phone app is a scaled down version of the Groundwire app with fewer features but the same great quality. I wish people would do just a little research before posting their comments.